I actually train less. I do fewer exercises on a given workout with Steve’s programming which I think is exactly what I needed. I think I was just trying to do too much before because all my lifts have gone up in just the short time I have been involved with Team Goggins Force. I think the mind is the most important aspect of anyone’s training. Your mind can be your greatest adversary or your worst enemy. Whether you are about to do a lift, lose weight, gain weight whatever it may be if your mind isn’t right or you’re not focused 110% you are setting yourself up for failure. That powerlifting is the absolute worst sport for comfort!!! LOL!!! I would say being able to push your body to its absolute limits. I think most people go throughout life and never truly know what the human body is really capable of. I have been working out since I was 12 and I have always enjoyed lifting heavy but my training revolved more around bodybuilding type workouts. It wasn’t until my good friend who competed on UGA’s powerlifting team called me up and told me that he wanted to do a bodybuilding show and he asked me if I would help him get ready for it and compete with him. I agreed to do so if afterwards he would coach me for a powerlifting meet. My first meet was the 2012 USAPL Georgia State Championship and after that I was hooked! I placed first in the 220lbs junior class at the 2012 USAPL Georgia State Championship. I placed first in the 220lbs junior class and 2nd in the open class at the 2013 USAPL Georgia State Championship. My best gym P.R’s to date are a 415 bench (405 paused), 523 squat, and a 600lbs deadlift at 220’s. I am influenced by every lifter who is dedicated to this sport. I would say music definitely! I always listen to music when I train and I don’t know of anyone that doesn’t get motivated to train after watching a Rocky movie. Lastly, I would say other lifters motivate me, especially if they are stronger than me. My buddy that introduced me to powerlifting Cody Leatherwood. His father Robert Leatherwood, my coach Steve Goggins, my wife Catherine, and mostly my Pawpaw. He has been my biggest influence in just life in general, he instilled many things in me growing up one of them was that quitting is never an option. Work! My job requires me to work long unpredictable hours which has made it difficult to have a consistent training schedule. To be honest, I am still trying to work through it. I just train around it the best I can. Sometimes I lift as early as 5:00a.m. or as late as 10:00p.m. Be consistent! Train hard! Train often! and I would suggest seeking someone out that is knowledgeable and reputable in the sport/ training (no broscience gurus) that can help cut your learning curve down. Most importantly, what you learn in the sport pass it on to other lifters especially beginners. Baseball in school, bodybuilding, martial arts, IPDA shooting. I also did some powerlifting while in school but the lifts at those meets were power clean (which I hate by the way) bench and squat. I am a Police Officer. More specifically, I work for the County Marshal’s Office and do the criminal animal cruelty investigations. Wait! What?! You mean there is life outside of powerlifting?!?! Just kidding lol. I enjoy working on cars/trucks, hunting, fishing, going to the martial arts dojo a couple times a week, I also go to the range and shoot as often as I can. 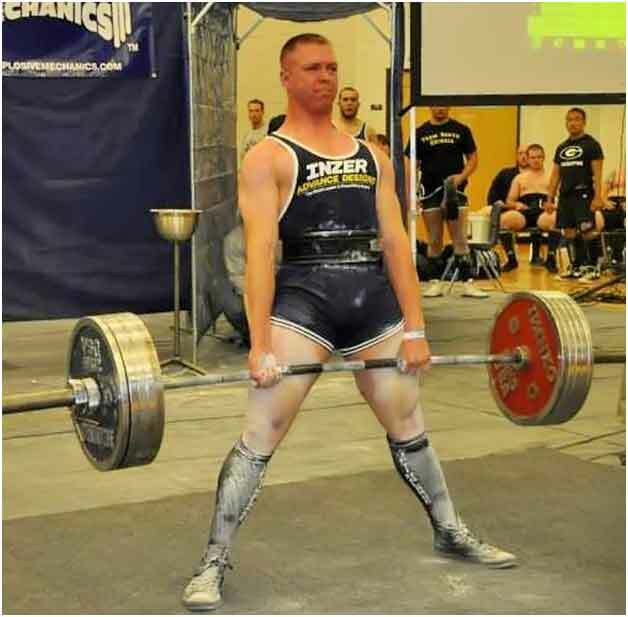 Well, I think anyone who has powerlifted for any length of time has heard the name Steve Goggins before. But I had the pleasure of meeting Steve at a local USAPL meet and I thought he was a super nice guy and incredibly humble for someone that is considered by many a legend in the sport. I later found out that Steve coaches close to where I live. So, when I decided to get serious about my training it only made sense that I seek Steve out. Wow, so many things to choose from. I like the fact that I never have to worry about my workout. I like being coached by someone that is so knowledgeable. But, my favorite part is probably the camaraderie between the fellow lifters. Even from the very first time I trained at the Goggins Force gym I felt welcome and lifters whom I just met cheered me on while I lifted. Which is awesome!